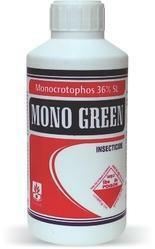 Our product range includes a wide range of monogreen 36 sl agricultural pesticides. Our company is highly esteemed in offering SL (Monogreen) to the clients. Monogreen is in great demand in the market that is widely used for controlling boll worms, borers and diamond black moth from crops. Offered range is processed at well equipped chemical lab by experienced professionals. This product is available in a variety of packaging options to cater the diverse requirements of or clients. Offered range is quite effective in killing insects on paddy, maize, castor, mustard, pulses, sugarcane, cotton, citrus, and coconut, coffee and cardamom plants.